Tyler Walker continues to prove to be worth his weight in gold to Mansfield Town’s promotion bid. His superbly-taken matchwinner against Cambridge United on Saturday rocketed the Stags into second place and eased the growing-tension in the One Call Stadium. It was a massive moment in the season and once more Walker was ice cool in the moment. That makes it 24 goals already with five games left to play and an outside chance of reaching that magic 30-goal target. Without Walker’s goals this season the Stags would currently be in the bottom half of the table. Walker has been involved in providing 19 points through goals he’s scored or assisted on this season, so without him they could have been down with Crewe in 15th place on 53 points. With injuries to fellow strikers Craig Davies and Danny Rose, Nottingham Forest loanee Walker has largely had to carry the burden alone. Indeed, he would have hugely benefited from playing alongside someone with the more physical presence of Davies, who has been so unlucky with his injury after signing. Davies may yet turn out to be a big player for the Stags next season. Although we still have the most crucial part of this season to come, it will be interesting to see what happens with Walker next season. With Aitor Karanka gone from the City Ground, the Martin O’Neill/Roy Keane managerial combination will be much more receptive to involving home-grown players like Walker. And his goalscoring exploits will suggest he has a chance. He is still only 22 and this season will have lifted his confidence no end, despite finding it hard to win some of the Mansfield supporters over. When last at Forest they were playing him out wide, but he has now shown he knows where the net is and, with his athletic build, is probably better suited for football at a higher level than the rough and tumble of League Two. Another option for Forest would be to step up his education with a season at League One. So a promotion for Mansfield would be just perfect all round. There will also be a question mark over the future of Walker’s fellow Forest loanee Jorge Grant, who at the age of 24 must know it’s now or never this summer as far as a Forest first team call goes. He exploded onto the Stags season with a string of man of the match displays before apparently fading. Now we know he was battling on with an injury and below-par and it would have been helpful to him if the club has intimated that before critics jumped onto his back. But a fully fit Grant is an asset to any club at this level and he may yet have a major part to play in the club’s history over the next few weeks. Last week could not have gone much better for Mansfield. Rivals Bury lost twice and off the field they have not paid their wages and tomorrow face a winding-up order in the High Court. That’s not a nice scenario for any club and I am sure everyone wishes them well while, at the same time, hope it affects them enough to stay below the Stags in that fight for the top three places. Champions-elect Lincoln City did the business at MK Dons as hoped and Tranmere Rovers’ remarkable run of wins was halted with just one point from two games. So Stags are now in the driving seat in second place and their fate in their own hands with all sides up there now having just five to play. 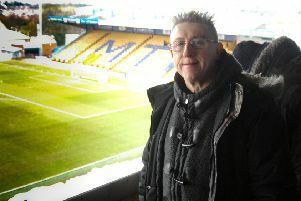 A trip to an out-of-sorts Northampton Town this Saturday offers big hopes of rich pickings for Mansfield as ex-Stags boss Keith Curle upsets supporters and players alike by saying they are only capable of ‘playing ugly’. At the same time you would expect Bury to beat fading Colchester at Gigg Lane – though you would have said that in midweek when they lost at home to Cambridge. Certainly Tranmere can do Mansfield a favour by beating visiting MK Dons. Admittedly it will draw Rovers closer to the mix but Dons have more points currently and offer the bigger threat. Whatever the outcome of this weekend, it will leave Stags facing one of the biggest Easters they have had for several years six days later with two massive games in four days.